The far right won elections this month in Slovenia. Can the Left mount a challenge? On June 3, Slovenia held early general elections. Incumbent prime minister Miro Cerar triggered the elections — the eighth parliamentary elections since the republic proclaimed independence from the former Federative Socialist Republic of Yugoslavia (SFRY) in 1991 — when he stepped down in March, three months before the end of his mandate. Since 2008, no government has lasted a full mandate. On election night, perhaps the most striking image was a map of the country that showed each constituency. All were marked yellow — the color of the victorious far-right party, the Slovenian Democratic Party (SDS). 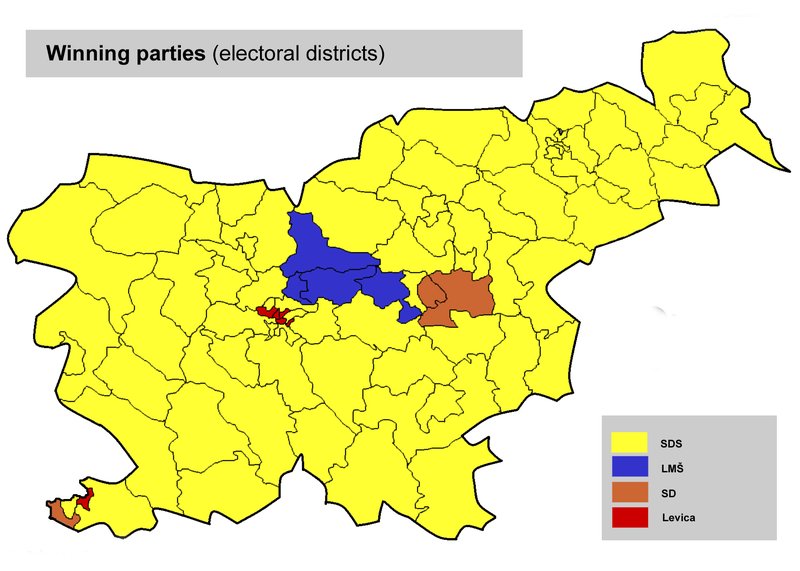 An image depicting electoral districts was similarly homogeneous, with only a few left-wing bastions breaking up the sea of yellow. Figure 1: The winners of electoral districts in the June 3 Slovenian elections. But the political landscape in Slovenia is far more complex. To understand it, we must first examine the dynamics of the post-socialist transition. In 1991, after a short-lived national unity government, a cadre of ex-communists and ex-socialists youth stepped in to lead the transition away from socialism. Going by the name the Liberal Democrats of Slovenia (LDS), the party headed three governments until 2004. Integration into Western markets was gradual but efficient. One of the only impediments was organized labor, which dragged out the process of privatization. State-owned enterprises were eventually transferred to private hands, but largely to local capitalists. Nonetheless, they quickly became part of an intricate network of post-socialist power. At the top of the early transitional government’s agenda was joining the European Union and the European Monetary Union. That required bringing policies in line with the EU criteria, which meant making the Slovenian economy more dependent on external capital and market demand. What appeared to be a neutral adaptation of institutional norms was in reality a shift toward ever-greater economic subordination. In 2004, Slovenia joined the EU and soon after, SDS, the far-right party, won the general elections. Its governing strategy differed from those of the previous governments. It pushed for more rapid liberalization and launched an offensive on public institutions such as higher education and the social-care system. Union mobilizations helped stop some of the government’s harshest neoliberal reforms, such as a flat tax system, but the SDS-led government continued with the EU integration model. Despite relative prosperity, the promised trickle-down effects weren’t materializing for many Slovenian workers. SDS lost power following the 2008 elections amid corruption allegations against its leader, Janez Janša. The Social Democrats (SD) — formal successors to the League of Communists of Slovenia, but now firm “third way” adherents — gained power for the first time. But their reign was brief. When the financial crisis hit in 2008, the party was caught flat-footed. A contracting German export sector drove down production in Slovenia, which depended on their market. Between the final quarter of 2008 and the first quarter of 2009, manufacturing dropped more than 25 percent — one of the largest declines of any OECD country. But the biggest crash occurred in the backbone of the Slovenian economy. The last quarter of 2008 saw the construction sector decline by more than 30 percent. Between 2007 and 2010, almost 35,000 jobs were lost and unemployment soared to more than 7 percent, with double-digit numbers among youth. Voters, upset with the record of the Social Democrats, gave SDS another chance. The party promptly implemented austerity, provoking popular anger that resulted in the biggest uprisings in the country’s history. Although the first mass protest, in the autumn of 2012, was called by trade unions, subsequent mobilizations emerged spontaneously, with a strong anti-corruption line. By the end of February 2013, the SDS-led government had fallen. Its successor was a center-left government led by the first (and still only) female prime minister, Alenka Bratušek. She struck a technocratic tone, worried that the so-called Troika (the European Commission, the European Central Bank, and the International Monetary Fund) would step in otherwise. Meanwhile, the crisis in Slovenia climbed to its peak. The total losses of nonfinancial corporations hit 2.2 billion euros, and the unemployment rate eclipsed 10 percent among the overall population (as well as 25 percent among young people). Almost 300,000 people had incomes below the the risk-of-poverty threshold. In 2014, due to infighting within her own party, Positive Slovenia (PS), Bratušek stepped down and, following general elections, was replaced as prime minister by Miro Cerar. A well-known jurist and son of both an Olympic medalist and the first female State Prosecutor General, Cerar won the elections on an openly centrist platform, projecting an image of professionalism, ethical probity, and pro-Europeanism. The election also marked the first time a new radical left coalition, the United Left, took part. It won six seats, bolstered by the still-hopeful winds of Greece’s radical left party Syriza, the popular support of an emerging young leftist scene, and the broad-based sense that the country was on the wrong course. Miro Cerar’s party presided over, nominally speaking, an extremely successful economic era, with economic growth among the highest in the EU. High economic growth, however, came at the cost of growing precarization among young people and unending austerity. Discontent festered below the positive headlines, and union activity increased in both the private and public sectors, as well as in previously nonunionized areas. Then in March of this year, at the very moment when negotiations between the state and the public sector unions had reached a deadlock, Cerar stepped down, bringing an abrupt end to his three-and-a-half-year tenure. The revolving door of leaders and the perpetual impasse in Slovenian politics has triggered a downward spiral in voter turnout and youth electoral participation. This time around turnout slid to 52 percent, a bit less than in 2014. SDS was the big winner, capturing almost 25 percent of the vote. The two center-left parties garnered around 25 percent combined, while the three centrist parties collected around 28 percent. The left-wing Levica (the successor to the United Left coalition) got 9 percent, while the two smaller right-wing parties collectively received 11 percent. Although SDS won in almost all electoral districts, there were a few dozen in which the center and left-wing parties gained more total votes than the right-wing parties (see Figure 2). Image 2: The map shows the dominant (winning) political clusters for each electoral district. As we can see, the right-wing parties gained most of their support in the east of the country, mainly in the least developed peripheral rural districts. Left-wing and centrist liberal parties gained most in the more developed western part of the country. And what, then, of the Right? The base of SDS is quite different from, say, those who attend Hungarian Guard marches. Still, this election marked the first time an SDS leader openly supported far-right organizations (for example, the Slovenian branch of Generation Identitaire / Generacija identitete, a racist movement originating in France). Another new development is the public and financial support from Hungary’s ruling far-right party, Fidesz, and the media companies around the prime minister, Viktor Orban. Orban and SDS leader Janez Janša started their friendship in January 2016, when Orban was visiting Slovenia on official business. After meeting with then-Prime Minister Cerar, he proceeded to a closed-door conference with Janša. Hungarian investments into SDS media outlets followed. Today, three Hungarian media companies connected to Orban own 45 percent of SDS’s media-company shares. Hungarian media also owns 52 percent of Nova Obzorja, which publishes a SDS newspaper, and Nova24tv.si (SDS TV) share the same address. Hungarians have so far invested over 2.2 million euros into SDS media, some of it in the months leading up to the elections. 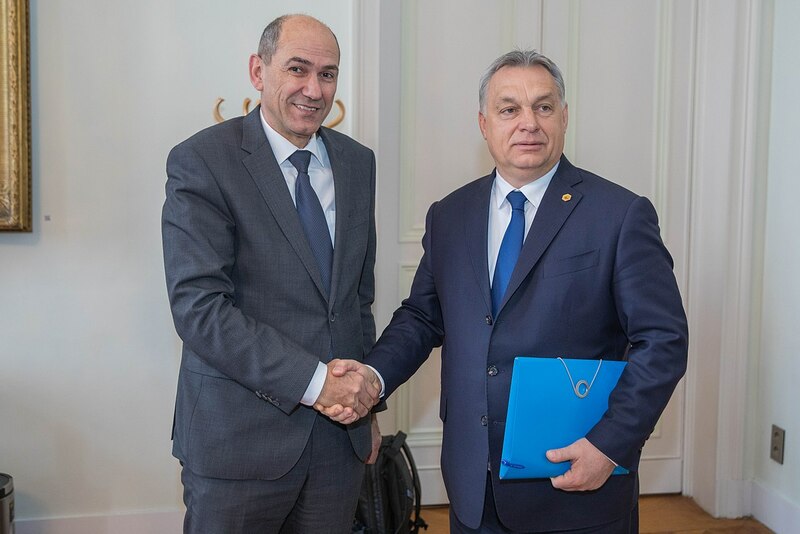 If there was any question of their tightening relationship, Orban also took part in the SDS Congress in May, where he declared his full support for Janša’s party. Janša himself is a fascinating figure. In Yugoslavia, he was a very active member of the League of Communists. In 1988, a few years before the socialist federation collapsed, he was tried in a military court on charges of exposing military secrets, and was given an eighteen-month prison sentence. Yet by 1991, during the ten-day Slovenian war for independence, he was serving as the minister of defense and was one of the war’s main strategists. He served two terms as prime minister (from 2004 to 2008 and 2012–13), before again landing in legal trouble. In 2013, he was sentenced to two years in prison for allegedly accepting a bribe from a Finnish firm to help it win a military-supply contract during his reign as prime minister. In 2014, while serving his sentence, he was again elected to parliament, but the Constitutional Court annulled the judgement of the Supreme Court and brought the case back for reexamination. The case was time-barred the same year. He then retreated from the public sphere, only to make a spectacular comeback in recent months. He’s since dominated the country’s politics. During the election campaign, Janša’s party emitted right-wing rhetoric on a whole host of topics, including the migrant crisis, women’s and LGBT rights, and the credibility of mass media. At the same time, the election results do not amount to the so-called Orbanization of Slovenia. SDS won 220,000 votes on June 3, 70,000 less than in 2011, when it came in second. For a party with an especially stable voter base (86.6 percent were return voters), this was a mediocre finish. The success of SDS is always in direct correlation to the amount of broken promises and lack of alternatives coming from the centrist and left-of-center parties. Slovenian society is culturally rather left wing, and can be mobilized against the Right — but it has to consider left parties worthy of support. it is still unclear what government, if any, will emerge from the June 3 contest. All of the center-left and center parties have said that they are — at least for now — unwilling to enter into a Janša-led coalition, and the other right-wing parties do not have the necessary number of MPs to form a majority government. A center-left government is also unlikely, since it would need to bring together at least six parties, and for the time being Levica is not that keen on joining this type of coalition. Nor are the other formations particularly open to Levica, whose demand for a referendum to leave NATO is unlikely to curry favor. So, a couple weeks removed from the election, the impasse continues, and another round of early elections this fall is a real possibility. Levica (Slovenian for “the Left”) first gained visibility during the 2014 elections. Going by the name the United Left (ZL), it was a coalition of three parties and some small civil society organizations. Two of the three coalition groups won MPs. But once inside the National Assembly, the parliamentarians gradually severed themselves from accountability procedures until they became the dominating force, leading without any democratic mandate from their parties. Increasingly, the focus was placed on parliamentary activities, to the exclusion of any grassroots initiative. Even a volunteer-based project meant to bring activists and intelligentsia together with trade unionists was neglected to the point of collapse. What, then, accounts for the party’s relative success? One important factor is that, unlike most Eastern European and Balkan countries, Slovenian society is culturally left-leaning. The Communist-led Liberation front (OF) and the Partisan movement during World War II are still positively regarded, recognized for the gains they delivered to workers and the contributions they made to Slovenian society. While one of Janša’s goals is to tarnish this chapter of the country’s history, his revisionist aims have been rather unsuccessful. Considering the current political situation in the region (and Europe more broadly), Levica appears much better off. At the same time, Levica’s relative improvement in MPs in the recent election hardly amounts to a breakthrough. 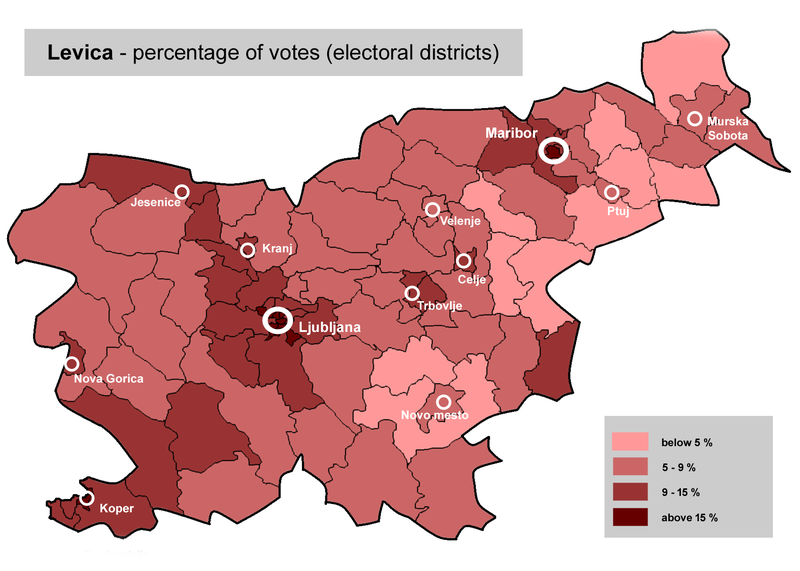 If we look at their under- and overrepresentation in different electoral districts, we see that their success is limited to urban centers — they won most of the central districts in Ljubljana and had good results in downtown Maribor, Nova Gorica, and in almost all of the seaside area in the wealthier southwest. Image 3: The map shows the percentage of votes for Levica in each of the electoral districts. We can see that the party gained the most votes in the developed and urban districts, and gained little support on the periphery. The party’s vote totals correspond with its strategy. Where people want roundtables, discussions, and other similar events bandying about progressive ideas, the party prospers. Where there are no venues or appetite for such conversation, Levica fails to gain traction. And after four years of sitting in parliamentary benches while discontinuing grassroots activities, both Levica’s voters and member base have changed. In 2016, a long internal dispute about whether to merge into a unified party — a direction favored by the parliamentary group and the Party of the European Left — led to a split in the leading party of the coalition, IDS. More than a hundred active members and organizers left the party — a sixth of the total membership at the time, or a third of the active membership. Some formed new grassroots organizations without parliamentary ambitions; most were demoralized and drifted to the sidelines. Levica was left with almost no experienced grassroots organizers. And it shows — their field presence in more marginal areas of the country is very poor, and the party’s link with unions amounts to personal connections among the organization’s leaders. The limits of Levica’s electoral strategy are also on display in the vision it puts forward. Whereas four years ago ZL was a voice for exploited and disenfranchised workers and dared to say that another world is possible, now Levica focuses on defending the welfare state, supplemented with rhetoric about veganism, animal rights, and equality before the law. The concrete manifestations of class struggle happen independently of them. Unable to engage with movements and transform social forces on the ground, it has confined itself to the parliamentary halls and became closer to a traditional social-democratic party. The breakdown of the June 3 vote highlights this point: Levica lost more than 35 percent of its voters from 2014 and replaced them with former supporters of the centrist SMC. It jettisoned radical politics for the sake of more moderate voters and short-term parliamentary success. While no one can predict whether Levica will change course and become a vehicle for radical transformation, among socialists and progressive organizers in Slovenia it is quite clear that the party has stopped being a political home of progressive movements. Its present dynamics have more to do with the day-to-day muck of parliamentary calculations, while its political strategy remains tied to the decrepit structures of the EU. At a time when it’s increasingly obvious that the EU is ready to impose its will on member countries, anti-immigrant conservatism strikes a chord with a certain demographic. SDS is harnessing the same kind of discontent with dependency that drove voters in UK to exit the EU. Unfortunately, they do so in divisive and bigoted terms that ultimately serves to safeguard the crisis-ridden EU. In order to have the leverage needed against the EU bureaucrats, Janša has to have class peace and continued growth. And, in order to achieve these goals, he’s already shown that he can go the extra mile and be a tough patriarch for tough times. That’s why by forming a cross-party, anti-Janša narrative, the liberal and nominally left-wing opposition is playing into his hands — compared to his bold appearance and alignment with Viktor Orban, they look weak and spineless, aligned with the faceless Brussels bureaucrats. In reality, what we have here are two blocs trying to save Europe, each in their own way — and the electorate keeps caring less and less. The result for Levica is therefore promising in this sense; it shows there are indeed many people willing to confront the surge to the right. But parliamentary solutions won’t suffice if they keep subordinating struggles from below to their own logic. The coming parliamentary deadlock might clear the way for the EU to push towards its own antidemocratic “Italian scenario” as a form of lesser-evilism, faced with a local unruly bigot. The Slovenian left must offer a way out of economic and political dependency and tie itself to struggles to defend the public sector and democratic rights. It must build a force that can repel pressures of both the “Orbanesque” and “Brusselesque” variety. That will require strengthening its relationship with working-class movements. It was organized labor that in the 1990s forced a decent minimum wage, the establishment of the Economic and Social Council, and one of the better labor laws in the world. It was trade union mobilizations that in 2005 prevented the introduction of a flat tax rate, and that in 2012 helped spark the autumn of uprisings that gave birth to many civil initiatives and mobilized countless young activists. And if the Slovenian left can escape the current impasse, it will be through a similar kind of mass, class-based politics. Tonja Jerele is a graduate student of sociology at the University of Ljubljana and a member of a progressive socialist organization Iskra. Matej Križanec is a sociology graduate from the University of Ljubljana and a member of a progressive socialist organization Iskra. Božidar Kolar is a philosophy graduate from the University of Ljubljana and a member of a progressive socialist organization Iskra. Jaša Veselinovič is a graduate student of international relations in Amsterdam and a member of progressive socialist organization Iskra.